Please join NAWIC Miami Chapter 41's monthly general membership meeting, where you will have an opportunity to network with female professionals within the construction industry. 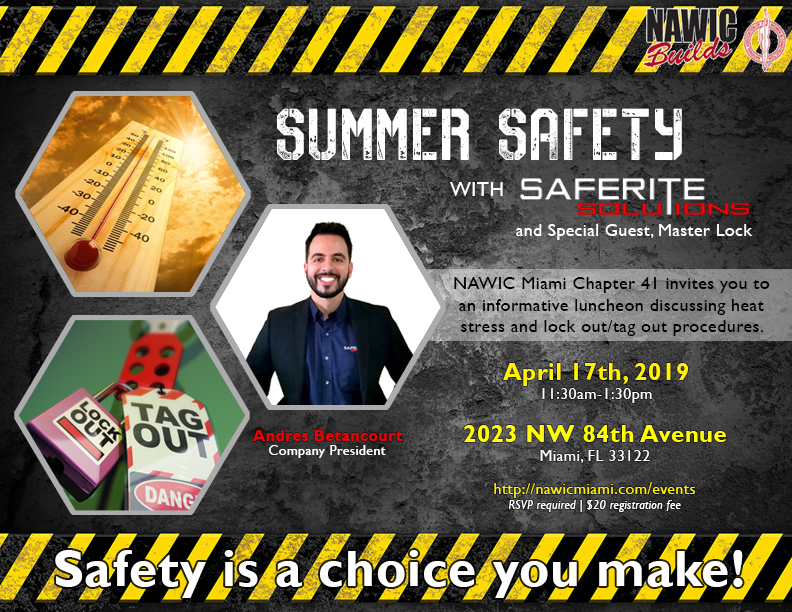 This month, we'll be hosting an interactive safety luncheon with Andres Betancourt from Saferite Solutions. Andres Betancourt is a FIU Graduate with a bachelor’s degree in Construction Management and the Company President for Saferite Solutions Inc. Close to 8 years in the company, his primary focus at Saferite is business development, company operations, product training and education for the different industries and companies. Andres is also a contributor and huge believer in giving back to the community through education, training and career fairs with constant participation at FIU and MDC alongside the upcoming industry professionals and current work force. The company, Saferite Solutions, is a safety product distributor and safety training center where we also have a department for garment customization including silk printing, heat transfers and embroidery. Saferite is based out of Florida serving all industries, although our specialization lies in construction. We currently have two distribution centers in Florida, the main one being in Miami and the other located in Orlando. In addition, we have 5 mobile safety stores visiting all job sites throughout the state of Florida. We pride ourselves on the quality of products and the safety training we provide because we prioritize on the initiative of preserving the greatest asset, the well-being and safety of the work force.